Complexity, controversy, and timidity continue to rule considerations of energy policy for the United States. This combination of impediments has guaranteed the continuing absence of a rational and comprehensive policy reconciling energy, environmental, economic, and security issues.A pragmatic set of energy milestones for America to achieve by the end of the first quarter of the next century can be easily defined:�	The last coal-fired power plant and the first environmentally benignfusion power plant would have been built.�	The first commercial assembly plant for hydrogen-fueled automobileswould have reached full production along with the creation of thenecessary hydrogen fuel infrastructure throughout the country.�	Clean, safe, and efficient transportation systems would have fullyreplaced the automobile in the core areas of the ten largest cities.�	The first total conversion of a southwestern suburb to solar heating andcooling, solar electric house power, and solar electric cars would havebeen completed. This paper presents the main theoretical and empirical issues concerning the HERMES-MIDAS Linked Systems (HMLS) of models. The systems are very large scale and are intended to perform European-wide medium-term investigations of the energy-economy interactions. The macroeconomic model follows the neo-Keynesian approach to economic modeling while the set of energy demand and supply models follows a mired engineering-econometric one. We facilitate the presentation of the linkage by proposing a typical aggregate neo-Keynesian model into which we introduce energy and proceed by establishing a general framework for energy-economy model linkages. This framework is applied to the coupling ofthe actual large-scale models. Finally, thepolicy analysis capabilities of the HMLS in contrast to the original HERMES model are examined by means of a theoretical and empirical comparison of the two systems' simulation properties and policy responses. Urbanization and industrialization are the most prom inentfeatures of economic development. The energy use changes brought by industrialization are well known, but urbanization also imposes major, if subtle, changes in energy use. Urbanization shifts production activities formerly undertaken in the home with little or no energy to outside producers who do use energy. One of the largest changes is the daily travel of urban residents, primarily but not exclusively, to work Personal transportation in rural areas generally entails little or no fuel use, while urban transportation does, particularly as incomes increase. Higher density living also induces substitutions of modern for traditional energy forms. Finally, food must be transported longer distances to urban consumers than to rural, agricultural consumers. Policies for managing a forest subject to open access exploitation are discussed from the viewpoint of encouraging greater efficiency in the use of woodfuels. The usefulness of market and non-market policy options formanagingforestresources is shown to depend on whether fuelwood collection is the major cause of deforestation or not and, if so, whether fuelwood collection procedures have a market valuation. This paper is about the pricing of contingent services. The immediate problem is this: What is the cost of the right to choose among pipeline and spot market purchases of natural gas? Changes in the regulation of natural gas pipelines created these rights for customers without providing a mechanism for compensating pipelines. Recently the Federal Energy Regulatory Commission recognized this oversight and called for the rights and obligations of pipelines and customers to be stated explicitly in pipeline service agreements. In the future, service agreements thatprovide switchingrights will be sold at a premium to those that do not. This paper shows how techniques of option pricing can be used to estimate the cost of switching rights. The cost depends on the spot and forward prices of gas, the volatility of gas prices, the rate of interest, and any fees or other restrictions on switching. The option pricing framework should prove useful for pricing contingent services in other sectors of the energy industry as well. Time-of-use (TOU) pricing has emerged in recent years as a popular rate program, offering utilities both a more efficient pricing mechanism and a tool for load management. Initial experiments with TOUpricing were generally designed to provide evidence on customer response to mandatory TOU rates, while residential TOU rates are currently being applied on a voluntary basis. In this paper evidence is provided on customer response in Pacific Gas and Electric's voluntary TOUrate experiment. Comparing the results to those obtained in earlier mandatory experiments, volunteers are found to have a greater ability to shift usage in response to TOUrates than comparable customers on mandatory rates. In this paper I examine the effect of changes in tax laws on the value of firm stock prices. The behavior of oil firm stock prices in 1969 (at the time of congressional votes to reduce the percentage depletion allowance) is studied to test the hypothesis that this legislation resulted in a decline in the value of oil firms. The empirical results show that statistically significant declines in the average value of oil frm stock prices did occur at the time of House and Senate committee votes. Cross-sectional tests show a significant correlation between the measured declines for individual firms and the expected declines predicted for those firms in the period surrounding one of the two committee votes. A number of states as well as the Federal Energy Regulatory Commission have been considering whether traditional regulatory regimes in electricity and natural gas markets should be replaced with competitive bidding systems. 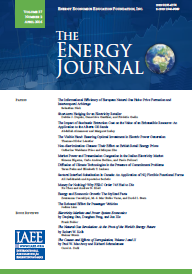 This shift is designed to yield a more efficient allocation of energy resources within the existing legal framework The paper examines both the theoretical basis and empirical evidence on bidding processes in light of the characteristics of energy markets, especially electricity markets. It then discusses the extent to which one can draw policy conclusions about designing specific bidding processes for these markets. It concludes that given the underlying complexity of the products involved, the optimal system for procuring power should include a mix of bidding negotiation and utility construction. For the purposes of explaining historical trends in relative fuel usage and energy efficiency, an encompassing framework must incorporate both the influence of changing fuel prices and technological change. Schurr (1982), Rosenberg (1983), Jorgenson (1984, 1986) and Berndt (1986) have provided recent documentation of the importance of these two factors in explaining productivity growth. Moreover, these studies indicate that a key to understanding such trends is analysis at the individual industrial sector level.In ignoring the influence of technological change on interfuel substitution, modern studies (e.g., Gopalakrishnan, 1987; Moghimzadeh and Kymm, 1986) have left unaltered the approach taken in the pioneering studies of Berndt and Wood (1975), Fuss (1977), Griffin and Gregory (1976) and Halvorsen (1977). If the world oil market is at all monopolistic, then a variable import fee (VIF) has more perverse effects than a flat import fee on the country that imposes it. Like an import quota, a VIF makes the importing country's demand for oil less elastic and increases the price paid by buyers in that country. Moreover, a VIF does not necessarily yield any tariff revenue to the country that imposes it. Finally, under very plausible conditions, a VIF may facilitate price discrimination by a monopolistic foreign producer against the country that imposes it. Henderson's main conclusions are incorrect. Oil is a fungible substance, and therefore price discrimination is not possible. (Some argue, however, that there is evidence the world oil market is segmented, and that a degree of price discrimination therefore is possible; Weiner, 1984). Consequently, a variable import fee (VIF) imposed on imported oil will shield the US economy from short-lived price collapses, as intended - and at the same time garner modest revenues for the Treasury. S. Fred Singer claims that my first three cases (in which there are no foreign demanders) are hardly realistic because price discrimination is impossible. Singer is correct about the realism of these cases: foreign demanders, after all, do exist. Nevertheless these cases are important for understanding the impact of a variable import fee. The bottom line-which Singer does not apparently dispute - is that if foreign oil producers have some degree of monopoly power, then a VIF will raise not only the price paid by domestic consumers but also the price charged by foreign producers. In its recently completed study of energy shocks, the Energy Modeling Forum (EMF) took 14 macroeconomic models and, by carefully comparing them, evaluated a number of policies for counteracting the negative impacts of an oil shock. The study provides an exceptional look at this important question, and the summary report by Hickman, Huntington, and Sweeney (1987) is full of valuable insights. Energy economists with an interest in this field should view the summary report, along with all its supporting reports and individual modeler summaries (available from EMF), as a required reference. At its heart, Harry Saunders' Comment raises two principal criticisms I of the EMF study, "Macroeconomic Impacts of Energy Shocks";The EMF study held constant the disrupted-state world oil price; effects of policy actions on the world oil price were not included. Saunders faults the EMF for not explicitly examining these effects. But further, he implies that, in estimating effects of policy actions to counter the oil shock, modelers should have held constant the disrupted-state quantity of oil consumed in the US.